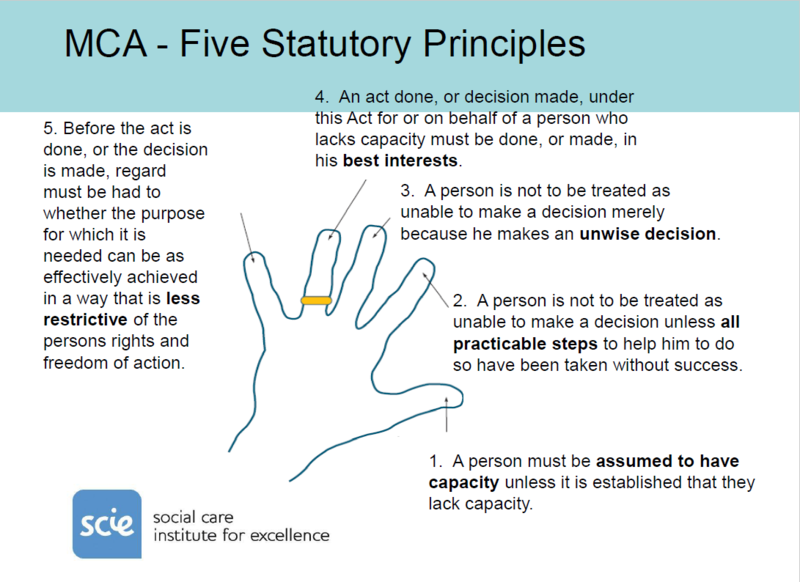 The Mental Capacity Act (MCA) 2005 came into force during 2007. The MCA is designed to protect and restore power to those vulnerable people who lack capacity. The MCA also supports those, over the age of 18, who have capacity and choose to plan for their future. It applies to everyone working in health and social care who is involved in the care, treatment and support of people aged 16. In the film below, from the Social Care Institute for Excellence, Baroness Finlay, (Chair of the National Mental Capacity Forum) explains the five principles of the Mental Capacity Act and how it can support care staff with difficult decisions. It’s a good introduction to the Act for people who need it, staff, carers and others. DoLS help ensure that an institution only restricts liberty safely and correctly and only when all other less restrictive options have been explored. The Local Authority manages this process and reports to the local Safeguarding Adults Board. Principle 1: A presumption of capacity. Every adult has the right to make his or her own decisions and must be assumed to have capacity to do so unless it is proved otherwise. Do not assume that someone cannot make a decision for themselves just because they have a particular medical condition or disability. Principle 2: Individuals being supported to make their own decisions. Make every effort to encourage and support people to make the decision for themselves. If lack of capacity is established, it is still important to involve the person as far as possible in making decisions. Principle 3: Unwise decisions. People have the right to make what others might regard as an unwise or eccentric decision. Principle 4: Best interests. If a person has been assessed as lacking capacity then any action taken, or any decision made for, or on behalf of that person, must be made in his or her best interests. Principle 5: Less restrictive option. Someone making a decision or acting on behalf of a person who lacks capacity must consider whether it is possible to decide or act in a way that would interfere less with the person’s rights and freedoms of action, or whether there is a need to decide or act at all.